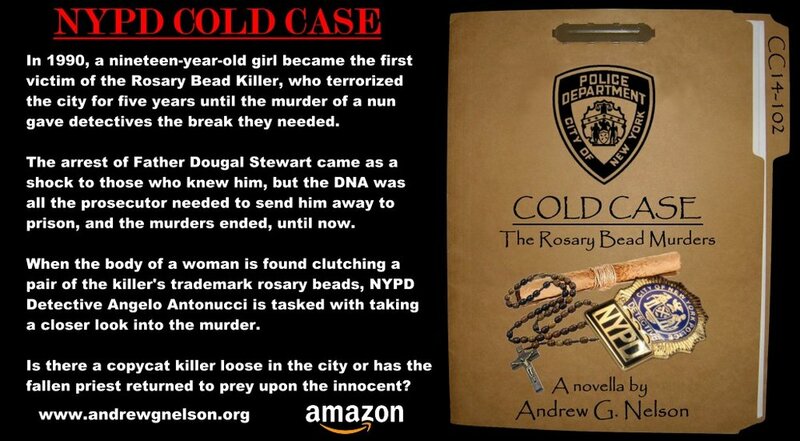 Well, I just made the final edits for the latest mystery novella Cold Case: The Rosary Bead Murders. I will be going through the E-Book submission process and hopefully it will appear on my Amazon author bookshelf before the end of the month. This new book sees the return of NYPD Detective Angelo Antonucci who is called in to look at the murder of a young woman that was found clutching a pair of rosary beads and a tell-tale note attributed to a serial killer who terrorized NYC in the 90's. Of course there will be an appearance by James Maguire, and perhaps even a hint or two as to the direction where I will be taking these characters next. This is a perfect weekend read and one that I hope you will enjoy. When you're done, I'd kindly ask that you please leave a review.